Climbing in Louisville: A Look At Louisville’s Rock Climbing Gyms | Joe Hayden Real Estate Team - Your Real Estate Experts! If you're a fan of extreme sports, or if you're looking into trying out a new activity, check out some of Louisville's rock climbing gyms. 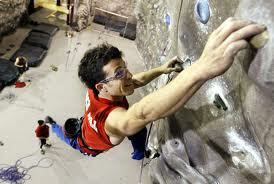 Rock climbing is a fantastic activity that can challenge you both mentally and physically. Learn how top-rope climbing works, try lead climbing, or if you don't want to go too high, give bouldering a try. If you're thinking of trying a new activity, or even if you have been climbing for years but are unsure of where to go, check out these three rock climbing gyms. Rocksport, which has been around since 1992, is probably the most popular rock climbing gym in all of Louisville. For starters, Rocksport is the biggest gym in the whole city meaning there are lots of walls and routes to choose from. The gym is 10,000 square feet and caters to climbers of all levels: there are walls for kids, beginners, intermediate-level climbers and advanced climbers. If you know how to belay, you can climb with a partner for just $15 a day; monthly passes are just $450. Rocksport also offers gear rental for those who don't have their own equipment: shoes are $5 and the harness is $3. Those who have never climbed before can learn how to work the ropes at one of the instructional climbing courses. These courses are extremely affordable: students can learn how to top-rope climb and belay for just $35. This gym is also great for events. The gym's controlled environment is perfect for kids' parties, business events, team-building sessions, and more. This gym is open every day, with slightly reduced hours on the weekend. While Hester's Family Fitness Recreation Center isn't dedicated to indoor climbing, the center itself does have an indoor climbing gym. The indoor climbing gym is 4,000 square feet and is built to be as realistic as possible. The walls are intended to replicate the outdoors: there are crevices, caves, overhangs and the wall is of a rock-like texture. It's possible to come to this gym for individual climbing or to take courses to improve skills. This gym is family-oriented, and offers courses and programs specifically for children. This gym is open Monday through Thursday from 5:00PM until 9:00PM, as well as Saturday from 12:00PM until 5:00PM. This gym is closed on Fridays and Sundays. While this gym isn't in Louisville, Lexington is only a short drive from Louisville. This gym is open every day for top-rope climbing, lead climbing and bouldering. This gym has 1,400 square feet of climbing wall. What's great about this gym is that outdoor trips are organized to Red River Gorge and Chattanooga, Tennessee. If you're a climbing enthusiast and you're not sure where you can go for your favorite activity, or if you're hoping to try this activity and find a new hobby, these three gyms are all fantastic choices. Once you're comfortable climbing on an inside wall, you can explore the fantastic climbing areas surrounding Louisville.